Cooperating weather makes this building deal much more enjoyable. In Central VA we had temps in the low 70s, sun, and breezy conditions. So, as much as I dislike the sanding process, I was able to move on with a few tasks. 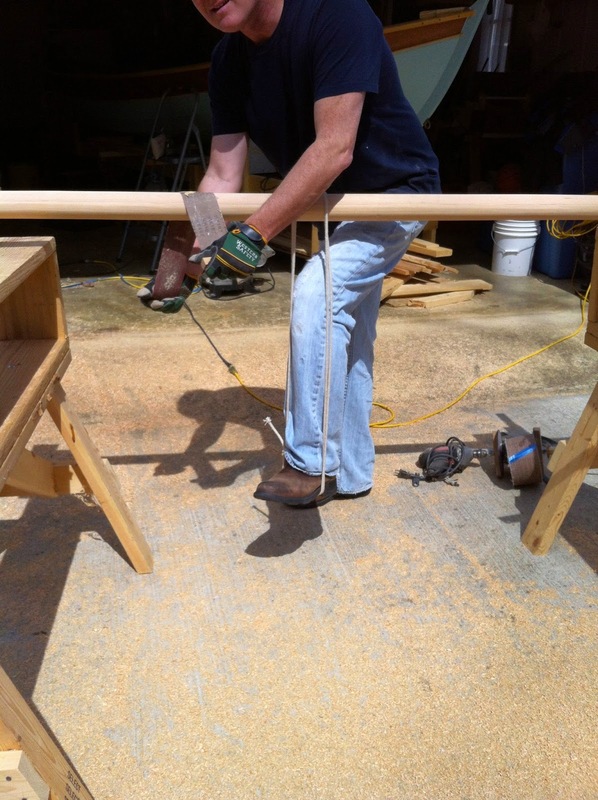 The biggest was knocking down the gunwale with the belt sander, 36 grit, and the router. The results are smooth and satisfactory. The breast hooks are close to their final shape too. A second bout of sanding went after the floor boards with the ROS and 120 grit. 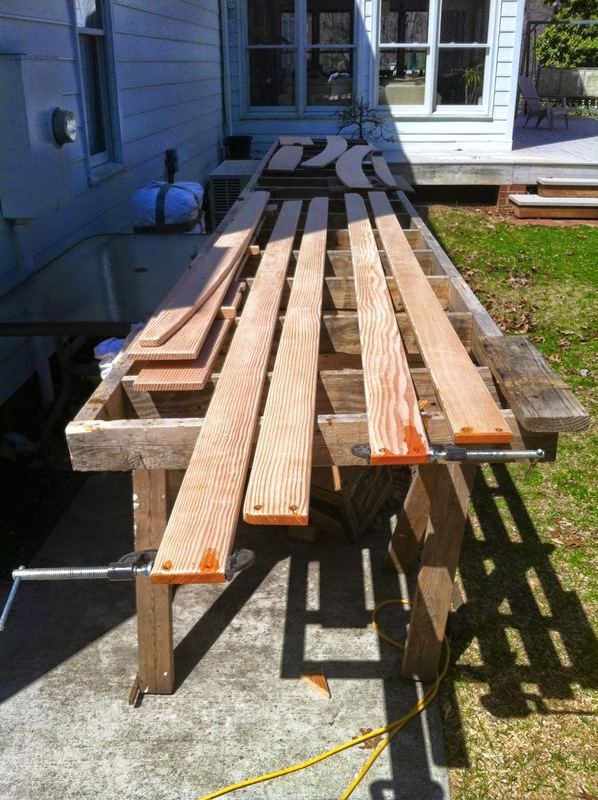 Several boards were cracked at the ends from too vigorous screw action. To fix this I saturated the end grain and flooded the countersunk holes. Hopefully that will hold. 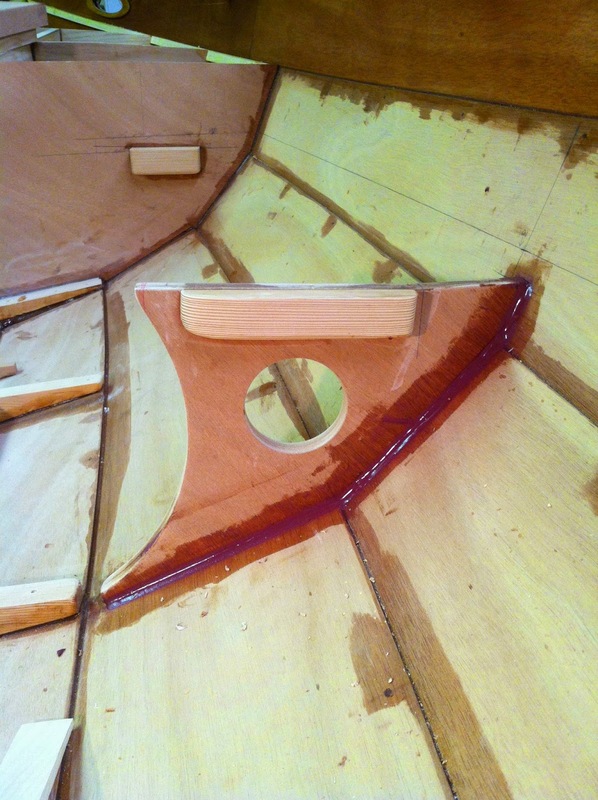 Since the plans for the open boat do not show any of the side bench web supports I reduced the 4 shown on each side to 2. 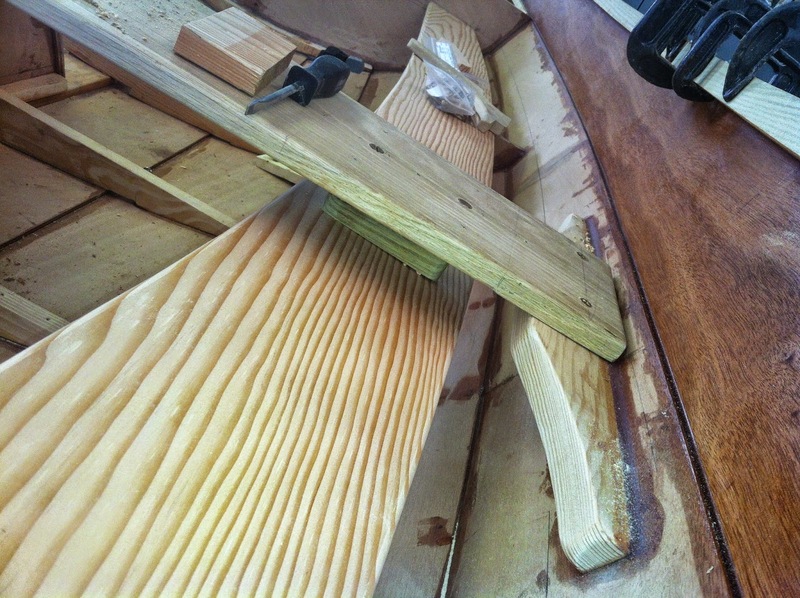 Support is gained from resting on blocks at the end bulkheads, the plywood webs, and hanging from the thwart. 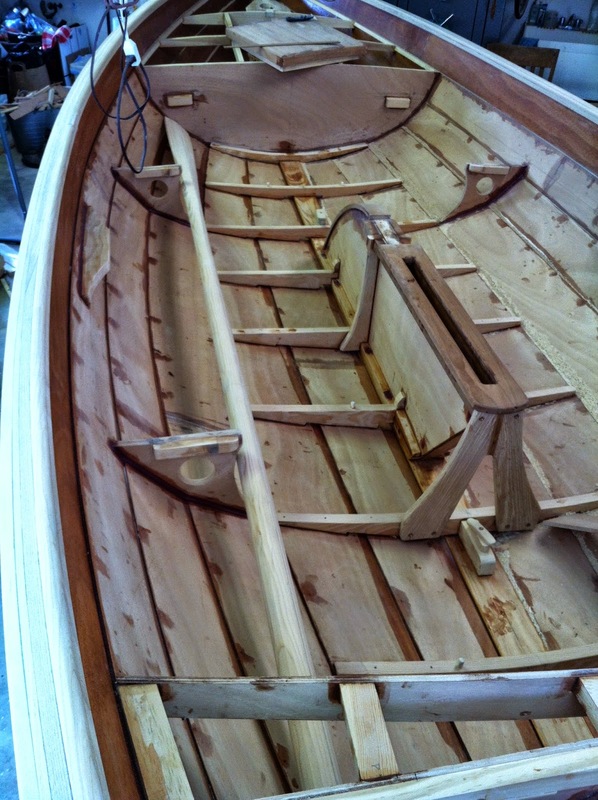 For that I bevelled a piece of teak and through bolted it between seat and thwart. The result is quite rugged and stiff. You can get just a peek of it in the next pic. 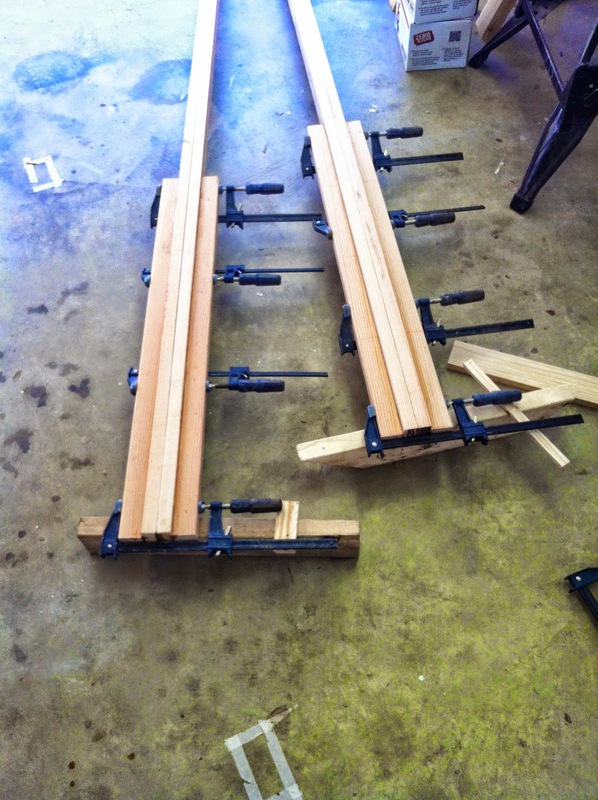 Teak bench spacer under thwart. 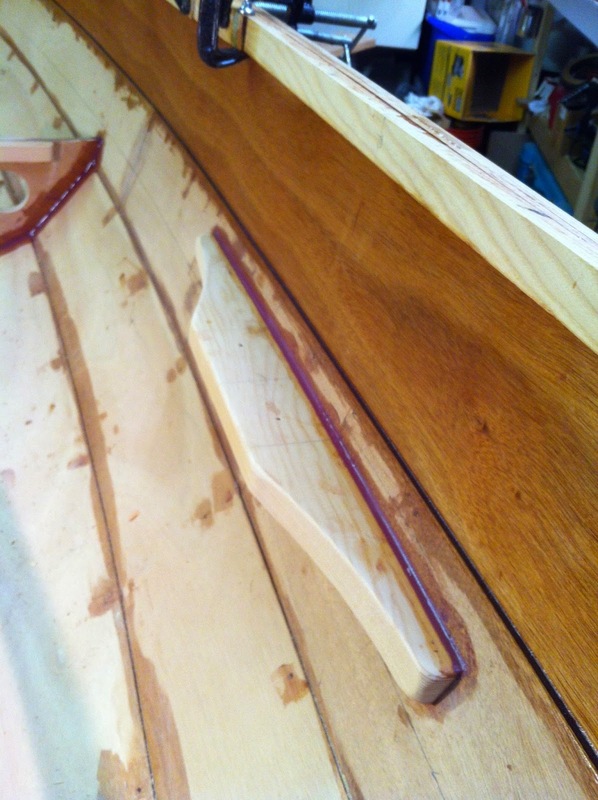 While the epoxy was flowing I blocked up the main boom and blanks for a pair of oars. 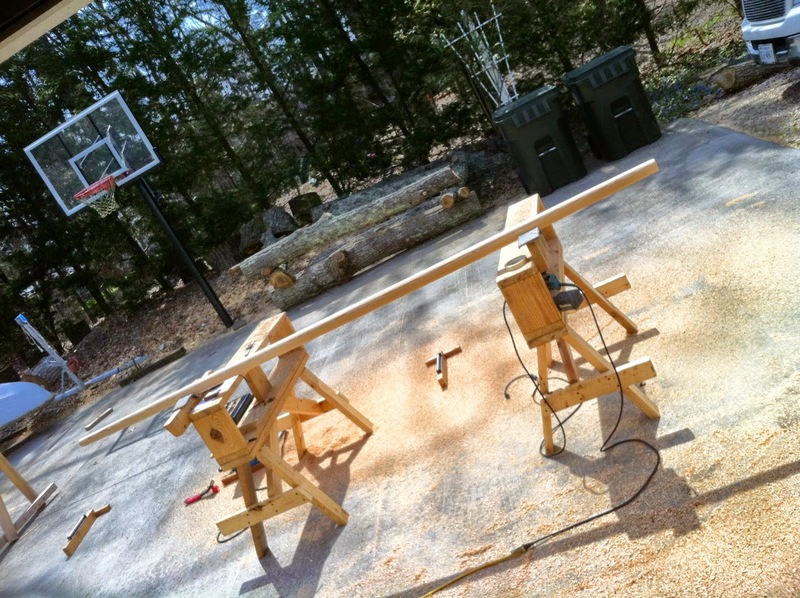 Aside from the epoxy dry time, I think I had maybe 2.5 hrs in getting from board to rounded spar. The real trick to this is of course an electric plane and going from 4 sided all the way down to 32 sided before breaking out the dreaded sand paper. Actually, a cut 80 grit sanding belt with wood blocks nailed to the ends for grips allowed for gentle removal and rounding. A shoe shining technique worked great. That and my employ of a doubled up loop of rope as a breaking stirrup to hold the work in place. You can make this as easy or hard a workout as desired. My previous sanding drum could remove too much material before you knew it. More control is in the shining. 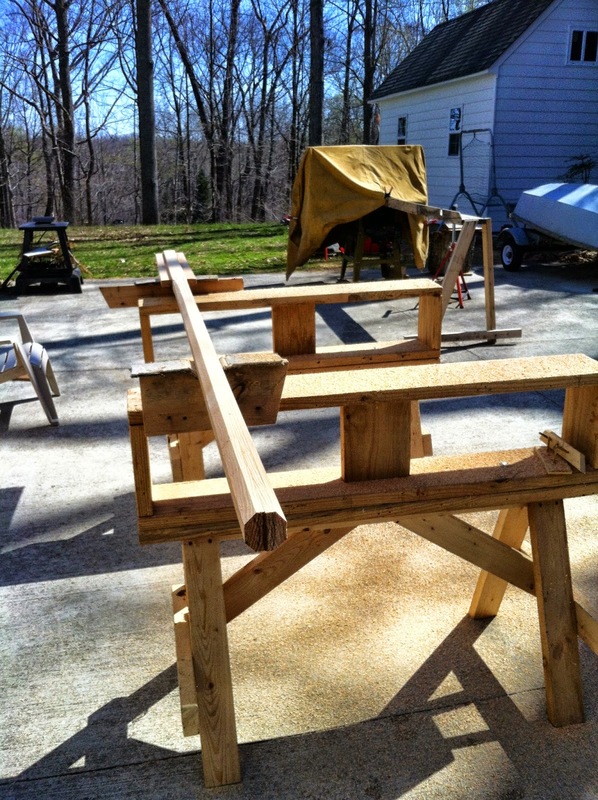 Manning benches with boom in carpeted chocks. Shoe shining with the stirrup. I chickened out of the spoon bladed oars and decided to go conventional. Here are the blocks and the different sided ends of the pair. 32 sided. Ready for “shoe shine”. 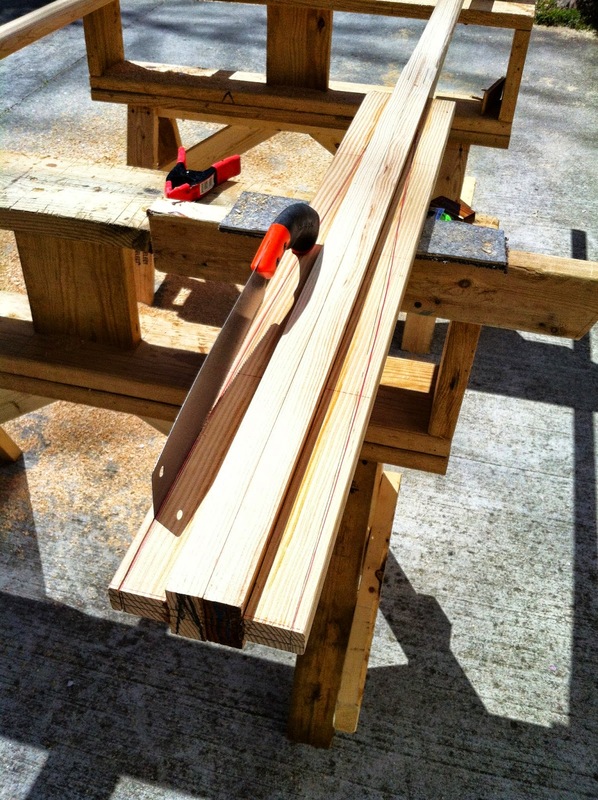 I broke my last jig saw blade and used the hand saw to trim the oar blades. 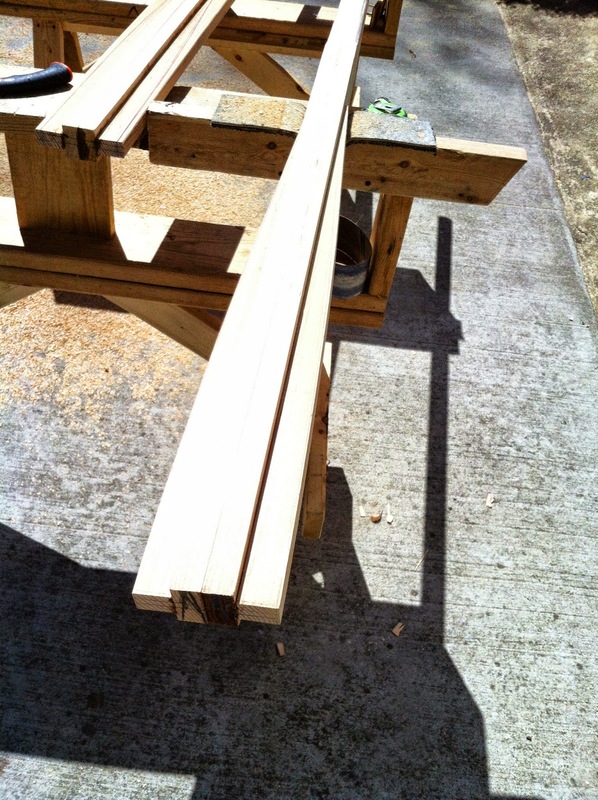 Here is a bit of advice: don’t trust the guy at the lumber yard to know where to cut the middle of the board. 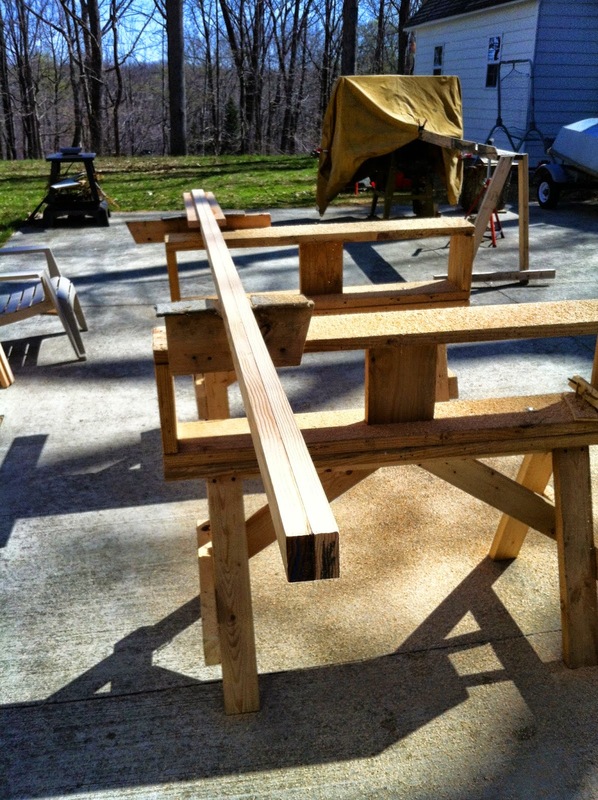 In triple checking the final oar length, I got this 2.5″ difference. The dark shading above is defined from rolling a sheet of paper at the cut line. Oar in stored position after some shaping. 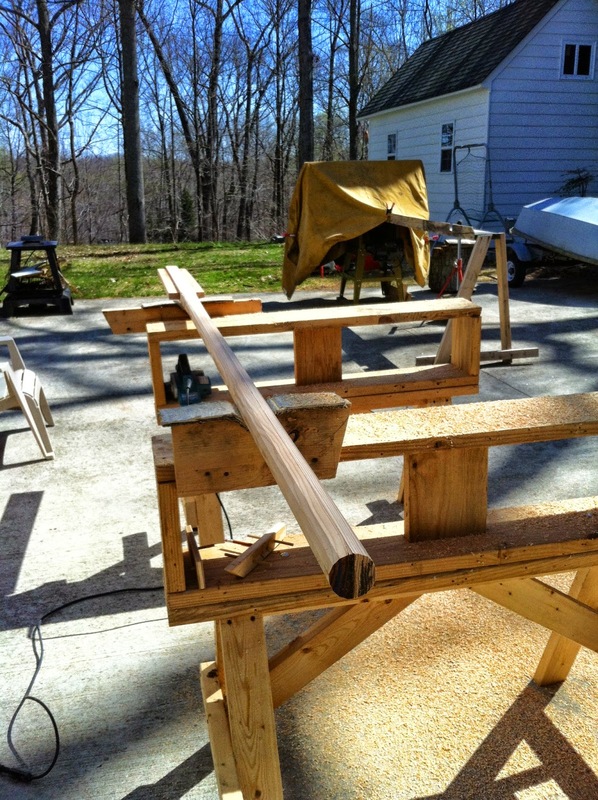 Shawn & Tenney has a good formula for oar length based on boats size. 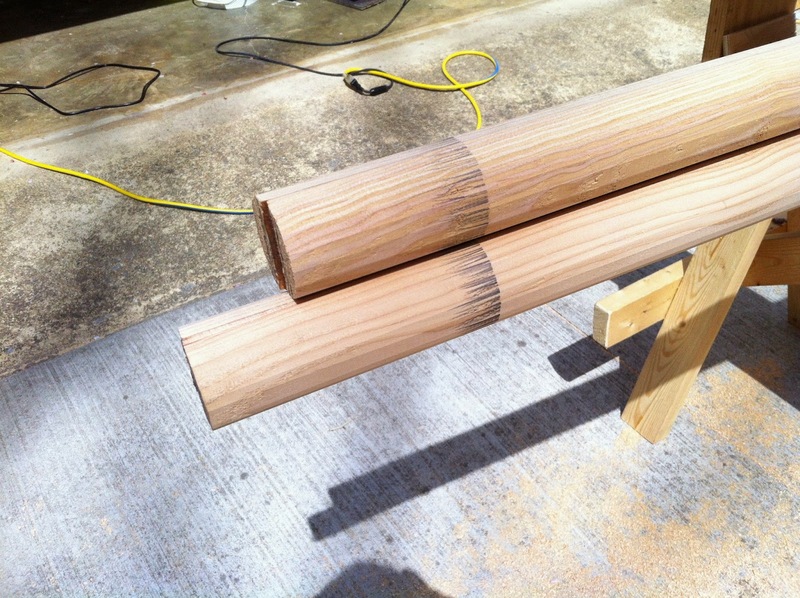 The Sooty would need 10′-3″ sticks (with a 2″ overlap) based on this. However, The fore and aft bulkheads are just shy of 10′ separation. Given that and my suspicion the added length will be a disadvantage in a troubled sea, I settled on 9′-8 1/4″ blades. These fit nicely in the boat and without the other two seat web supports, almost tuck up under the side benches. I like this. If necessary I can lash them to the webs. The blade nestles in the curve of the hull. 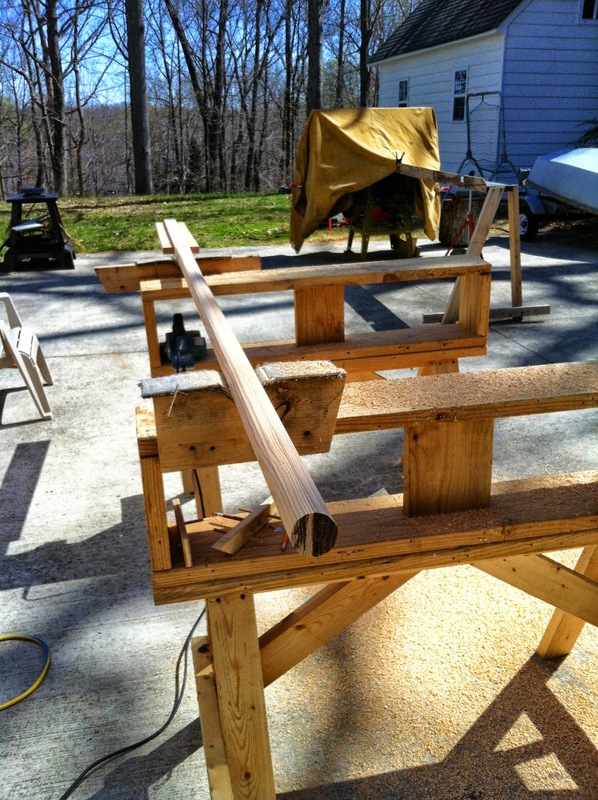 I may glue a check forward to receive the handle end or vice versa. Lastly, used the red microballons to fair a couple fillets to either side of the webs, thwart support, and a couple scuffs from the saw on the centercase. Ah, almost forgot. I got Horns and oarlocks from Shaw & Tenney. I went with the angled brackets and fitted them to the inwales. The typical sockets seemed to remove too much material in this key structural elements and raising them on cheek blocks would eliminate that as a seat on the rail. I’ll post that pic when I mount them again.